Language Scientific employs a rigorous Linguistic Validation and Cognitive Debriefing process that follows the International Society for Pharmacoeconomics and Outcomes Research (ISPOR) recommended methodology. First, the questionnaire or measure undergoes a Translatability Review to discover and assess any potential concept or wording issues that may arise during translation and adaptation for target locales. Based on the results of the Translatability Review and customer consultations, we draft detailed instructions to the linguistic teams with explanations of key constructs and guidelines on how to resolve specific problems or ambiguities we discovered. We also begin recruiting teams for each target country and work with the customer to obtain copyright permissions for translation. Next, we perform two forward translations using independent, certified translators. During reconciliation, the Project Manager compares the two translations and compiles them into a unified translation. This compiled translation goes through proofing and formatting. Following reconciliation of the two independent forward translations, a literal back translation is done by a third translator with no previous knowledge of the original instrument. 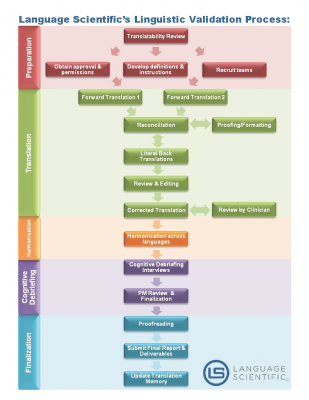 This back translation helps the Project Manager perform Translation Review to assess translation accuracy and to identify potential discrepancies in content value. At this step, a Corrected Translation is generated. If the instrument is disease- or condition-specific, the Corrected Translation is reviewed by a clinician practicing in the target country in the relevant field. This clinician verifies that references to medical conditions, symptoms and disorders are expressed using terms the clinician uses with local patients. In the Harmonization stage, any content value variances among the translations in all the target languages are identified and resolved. This harmonization provides uniformity across all language translations. Next, Cognitive Debriefing is done to ensure that the validated instrument is both culturally acceptable and contextually relevant to target populations. Language Scientific uses in-country professionals experienced in interviewing techniques such as psychologists, psychiatrists or social workers. These investigators conduct cognitive debriefing interviews with 5–8 subjects that reflect the potential instrument respondent population. After interviews are complete, an interview report is generated. Finally, the Project Manager reviews the Cognitive Debriefing report and finalizes the translation. A final round of proofreading occurs, and the databases are updated. A final report detailing Language Scientific’s Linguistic Validation process and the final translations are sent to customer. Sometimes, translation is not enough. A well translated text has the same meaning as the original. However, with patient questionnaires used in global clinical trials, you need more than equivalence of meaning, you need equivalence of construct value for each culture. For example, if a Quality of Life (QoL) item asks about the subject’s ability to perform typical activities and uses “playing golf” as an example, simple translation may not be adequate for countries where playing golf is not considered typical. A different activity that has equivalent construct value may must be identified for each target language and region. In order to be used as valid research instruments in international clinical trials, patient questionnaires must be culturally adapted and the translations need to be linguistically validated. An instrument that did not undergo a linguistic validation process may threaten the validity of research data and the safe aggregation of global data sets. The need to translate and adapt patient questionnaires for use in multiple languages and geographical regions has grown rapidly. This is due, in part, to the global scope of many clinical trials, as well as to the new FDA and EMEA guidelines for using Patient Reported Outcome (PRO) endpoints from international clinical trials to support label claims. Specifically, in their 2009 Guidance, the FDA recommends that sponsors provide evidence that content validity and other measurement properties are adequately similar between all versions used in the clinical trial. Language Scientific offers fully compliant Linguistic Validation and Cultural Adaptation services (including Cognitive Debriefing) to ensure item equivalence between an instrument’s original source text and translated versions. This can be critical to ensure that content validity is not affected by translation, and that data across sites can be pooled. Our ASKnetwork™ of project managers, certified translators, in-country investigators, clinicians, psychologists, linguists and other professionals residing in 120 countries, combined with our ISO 9001:2015 and ISO 17100:2015 certified processes, allows us to confidently meet our customer’s cost and deadline requirements. Language Scientific’s Linguistic Validation services verify that translations of all items are interpreted in the same way across target populations and regions and have the same content validity. You can be sure that measurement properties of the items will be the same across different language versions of the instrument, that data can be validly pooled across international sites and that the process will meet FDA and EMEA guidelines.